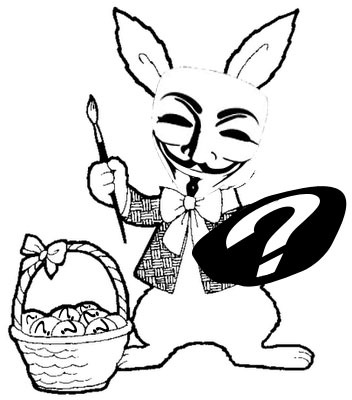 The Anonymous have launched a cyber attack against the Easter Bunny. The Anonymous, notorious for their response to the concept of authority across the Internet, do not stop at political sites. “We are here, a legion, Anonymous!” was the message spread on Twitter, Facebook and on semi-pornographic pictures pinned on Pinterest. “The Easter Bunny, this pseudo-religious atrocity has to be taken down. What would Jesus do?” said the message by the Anonymous. Indeed, the page of Track the Easter Bunny showed nothing but zeros today, despite the obvious non-arrival of the fictional hare character devised by the media. “Take that, Easter Bunny culturists!” continued the messages by Anonymous. “As members of PETA we oppose the abuse of animal characters in stories. The Easter Bunny does not exist but kids are told to believe in it, just like Santa!” the message by Anonymous ended with. Thousands if not millions of kids attempting to figure out where in the world is the Easter Bunny were left disappointed and prone to changing their religion as adults.